6-4-15 Offshore Orca 0139 (Killer Whale) from Ron’s whale series. GENERAL CHARACTERISTICS: Black on top with white undersides and white patches near their eyes; highly variable gray or white saddle behind the dorsal fins. They have the second heaviest brain among marine mammals (only the sperm whale which has the heaviest brain of any animal is heavier. For photos in the wild see reference links below. Males: Up to 10 m (32 ft) in length and can weigh up to 10,000 kg (22,000 pounds). Females; Up to 8.5 m (28 ft) in length and can weigh up to 7,500 kg (16,500 pounds). DISTRIBUTION/HABITAT: The most widely distributed marine mammals. Ten ectotypes are found in all parts of the oceans; most abundant in colder waters, including Antarctica, the North Atlantic and Pacific Oceans. DIET: They swim in groups, like wolf packs and may reach speed bursts of 55 Kilometers (34 miles) per hour while hunting fish, marine mammals and sharks. Off Shore Orcas’ teeth are worn down from eating small sharks (generally dogfish), which have rough skin. See the teeth offshore Orca 0139 above. Orca depend heavily on underwater sound for orientation, feeding, and communication. Some Orcas work together to ‘herd’ fish, before stunning the prey with strikes from the tail flukes, or join together in coordinated attacks on large whales. REPRODUCTION: O. orca reach sexual maturity when they grow to about 4.6 m-5.4 m (15-18 ft) long, There is no distinct calving season. Newborns are up to 2.4 m (8 ft) long and weighing about 180 kg (400 pounds). They are nursed for at least a year, and may be weaned between 1-2 years old. It is thought that females give birth about every 5 years for an average period of 25 years. PREDATORS: None. Killer whales are marine apex predators. CONSERVATION: IUCN Redlist: data deficient (DD). All marine mammals, including Killer whales, are protected in the United States. Global population at a minimum of about 50,000 animals. Threats: Orca are also sometimes seen as competitors by fishermen and are often shot as a result. In addition, the orca may occasionally be caught accidentally in trawl and driftnet fisheries and overfishing can reduce its food supply. Toxin accumulations that settle in their fatty tissue, such as PCBs, PBDEs and brominated fire retardants, are other hazards. REMARKS: Highly social matriarchal societies; relying on underwater sound for orientation, feeding, and communication. They have relatively stable social groups that often range in size from 2 to 15 animals. Groups as large as several hundred individuals are rare. Three types of Killer whales differ in morphology, ecology, behavior, and genetics. Resident, Transient, and Offshore. Resident Orca remain in one general area, in small family groups, and prefer salmon as their main prey item. In the U.S. North Pacific. Transient Orca are found throughout the eastern North Pacific, and have primarily been studied in coastal waters. Their geographic range overlaps that of the resident and offshore Killer whales. They often eat marine mammals, and migrating gray whale calves. Offshores Orca have the largest geographic range of any Killer whale community in the northeastern Pacific and often occur 15 km (9 miles) or more offshore. They also are found in coastal waters and occasionally enter protected inshore waters congregating in groups of 20-75 animals with occasional sightings of larger groups up to 200 animals. SPECIAL NOTE: This Offshore Orca was known to scientists before it died. It was last seen near Vancouver Island in Sept. 2011. This 5.5 m (18 ft) Killer Whale was discovered washed up on a beach Point Reyes, California Nov., 2011. Orca 0139 was collected and examined and was noted to have a broken rib which was the likely cause of death. The ID was was confirmed by photos of his dorsal fin and saddle patch. It has been on display at the California Academy of Sciences since 2013. Alive, he weighed between 1360 kg – 1,800 kg (3000 and 4000 pounds), and was about 5.4 m (18 ft) long. His head alone weighed 91 kg (200 pounds). Off Shore Orca 0139 has been on display at the California Academy of Sciences since 2013. National Oceanic and Atmospheric Administration www.nmfs.noaa.gov/pr/species/mammals/whales/killer-whale…. Shirihai, H & Jarrett (2006) Whales Dolphins and Other Marine Mammals of the World Princeton University Press. Evans, P & Weinrich, M (2002) Whales Dolphins and Porpoises D K London New York Munich Melbourne and Delhi. Reeves, R, R, et al (2002) Guide to Marine Mammals of the World Chanticleer Press, Inc.
Habitat: They spend a lot of their time swimming in the ocean but while on land they prefer sandy beaches and flat rocky areas that have plenty of shade and tidal pools. While at sea they will rarely venture further than 16 Kms (10 miles) from the coast. Diet: Fish, squid, octopus and crustaceans. 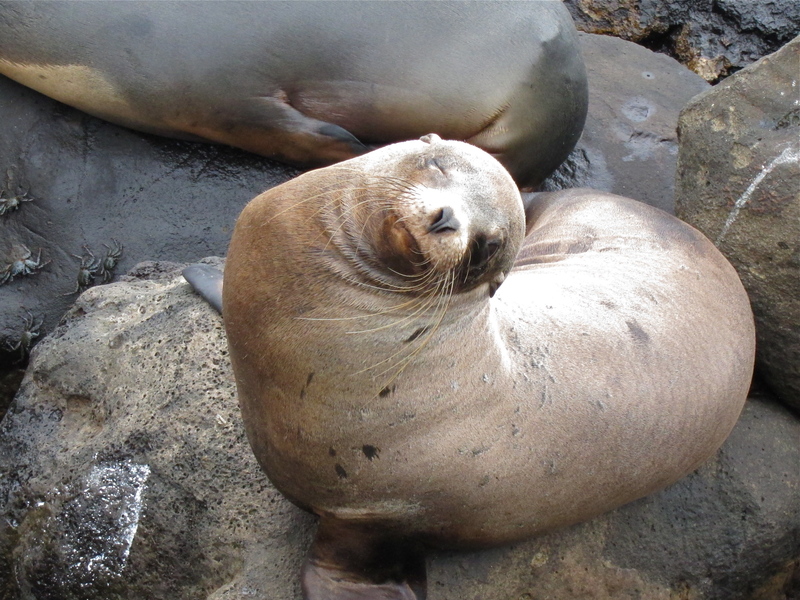 Predators: The main predators of Galapagos Sea Lions are sharks and killer whales. Dogs are also known to prey upon pups. Reproduction: Breed between May and January and mating usually occurs in the water. Males hold their territories for 10 days – 3 months and during this time they aggressively defend it. After a gestation period of approximately 9 months, females give birth to 1 pup. When the pups are born they weigh approximately 6 Kgs (13.2 lbs) and they are approximately 75 cms (29.5 inches) long. 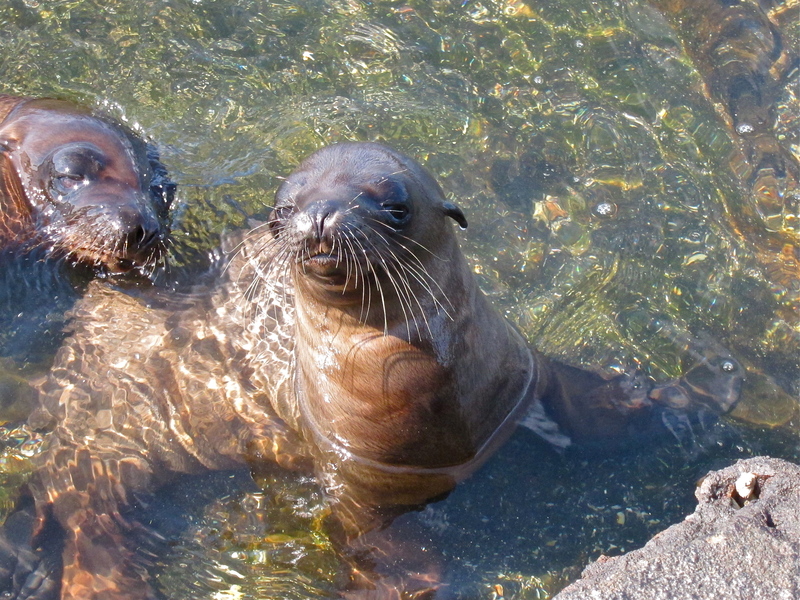 When the pups reach 1 – 2 weeks old they will venture into the water and start to learn how to swim. They are weaned when they reach 11 – 12 months. 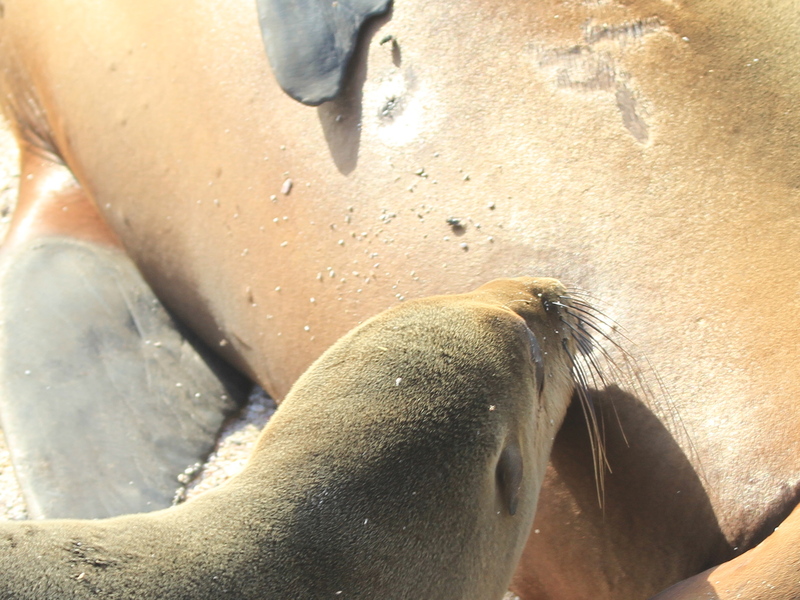 Remarks; Galápagos Sea Lions are inquisitive and playful yet aggressive at times. 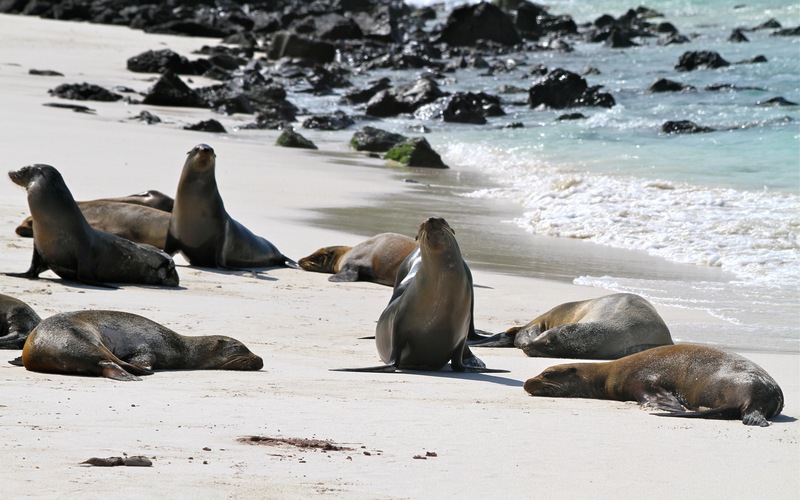 They are attractive and endearing but also lazy as they lie on beaches replenishing their oxygen. They may be seen body surfing the waves and always seem to be playing with something including each other, iguanas, penguins, crabs or just a piece of seaweed.